The blue light means nighty-night! 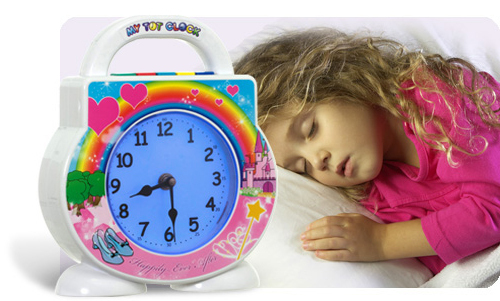 Not only will your child enjoy their new built-in nightlight, but they will absolutely love the extra bedtime stories and lullabies that play off little cartridges called Tot Clock Treasures. As a little treat, let your child pick out their favorite Treasure and plug it in themselves! They will enjoy their new bedtime routine, and you will love how quickly this magic clock eliminates the most typical toddler sleep problems, like negotiating before bed, waking in the middle of the night (or too early in the morning), or sneaking into mommy’s bed. With My Tot Clock, the whole family will sleep better!